Employment Growth of Fashion & Apparel Industry Cluster | Propel L.A. 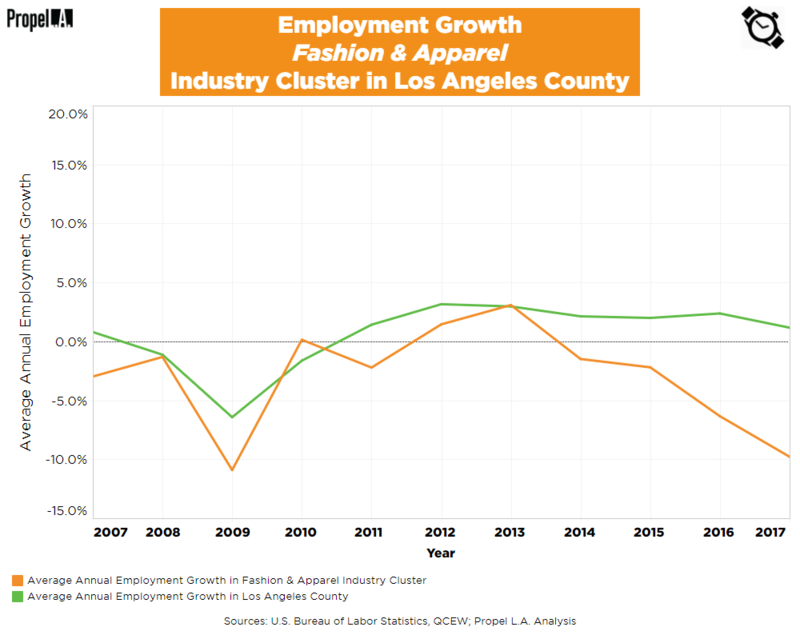 The Los Angeles County’s Fashion and Apparel industry cluster (“Fashion”) experienced negative employment growth nearly every year, with an average of -2.96% over the past 10 years. For comparison, the green line represents the average employment growth of the whole County, irrespective of industries or clusters. Any rate below 0%, even if greater than the previous year, still indicates a decline in employment. Ilse Metchek, president of the California Fashion Association, has a positive outlook on the fashion industry. Metchek believes that fashion and apparel jobs permeate other industries, such as “high-tech, 3-D, artificial intelligence and robotics,” ensuring they stay relevant (Pasadena Star News, August 2017). However, other industry leaders say that the automation of jobs has hurt the fashion industry. With artificial intelligence creating clothing and predicting consumer demand, clothes buyers and merchandise planners who used to decide which clothes to inventory are losing out on jobs (New York Times, July 2018). Furthermore, the apparel industry is being hurt by the 2018 political climate. With the increase in tariffs driving prices up, retail companies nationwide are being forced to downsize their operations and thus workforce (Footwear News, July 2018). Annual employment growth was calculated by dividing the change in number of employees between two consecutive years by the number of employees in the preceding year within all he selected NAICS industries. NAICS industries were selected by using the definition of the industry cluster prepared for Otis College of Art and Design by the Institute for Applied Economics at the LAEDC (May 2017). Calculations only account for private ownership. To learn what the Fashion & Apparel industry cluster or an industry cluster is, read here.